Martha Stewart Living taps clé Zellige tiles for a product feature. The piece, titled “Fit to be Tiled,” opens with “It covers backsplashes and bathrooms the world over, but tile has loads of unlocked design potential. When you play with color and pattern, hard- working ceramic and porcelain surfaces become modern mosaics, and squares of leather, glass, and other unexpected mediums add major polish. 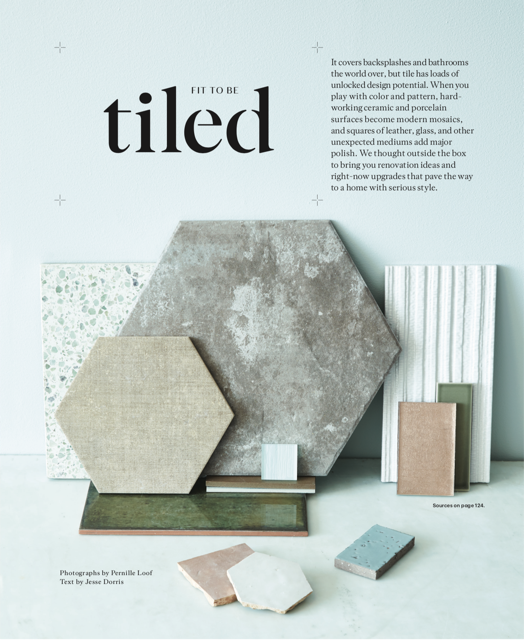 We thought outside the box to bring you renovation ideas and right-now upgrades that pave the way to a home with serious style.” The full article is a smart survey of popular tiles. The Zellige tiles are made of natural glazed Moroccan terracotta that come in a number of shapes and colors. In both pale and bright hues, cle named the classic white zellige Weathered White because even though it is a white terracotta tile of a singular color, that color is made up of, literally, dozens of shades of white including – grays, creams, pinks, celadons and even blues. our weathered white is to white glazed terracotta tiles what opals are to white gemstones.